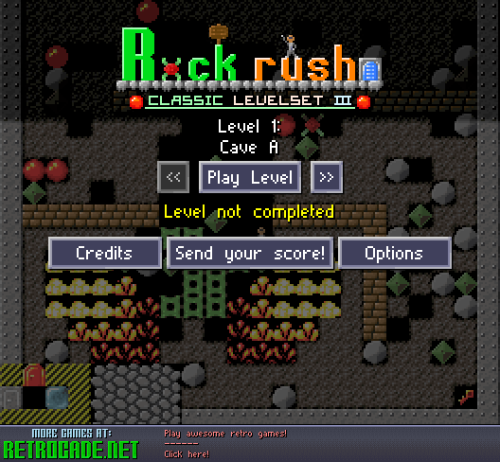 Rock Rush: Classic 3 — Fresh off the code press from us at Retrocade is Rock Rush, our very own Flash version of the classic Boulder Dash! Dig through bug-infested caves dodging boulders, triggering magic walls, and collecting diamonds until you have enough to open the exit. But it doesn't stop there. Depending on which version of Rock Rush you play there may be even more challenging elements to figure out before those gems come within your grasp...CLASSIC III: The Boulder Dash series was incredibly successful and spawned many variations and sequels. These levels were taken from the third official follow-up and should provide a good challenge for players of all skill levels.